The Donetsk Oblast (Ukrainian: Доне́цька о́бласть, translit. Donets'ka oblast'; Russian: Доне́цкая о́бласть, tr. Donetskaya oblast', IPA: [dɐˈnʲɛtskəjə ˈobɫəsʲtʲ]), also referred to as Donechyna (Ukrainian: Донеччина, translit. Donechchyna; Russian: Донетчина, tr. Donetchina; literally: Donetsia), is an oblast (province) of eastern Ukraine. It is the most populated oblast, with around 4.5 million residents. Its administrative center is Donetsk; however, its Regional State Administration has been temporarily relocated to Kramatorsk because of the ongoing crisis in Donetsk. Historically, the region is an important part of the Donbas region. Until November 1961, it bore the name Stalino Oblast as Donetsk was then named "Stalino", in honour of Joseph Stalin. As part of the De-Stalinization process, it was renamed as its administrative center after Siversky Donets, the main artery of East Ukraine. The oblast is known for its urban sprawl of Donetsk-Makiivka and Horlivka-Yenakieve and it is often associated with coal mining industry. On April 7, 2014, following the annexation of Crimea by Russia, Russian-backed militants occupying the Donetsk Oblast administrative building declared independence from Ukraine and staged an unrecognized referendum on separating from Ukraine on 11 May 2014. Subsequently, the War in Donbass started. After Donetsk fell to the insurgents, the Donetsk Oblast administration was relocated to Mariupol and later to Kramatorsk. Before the establishment of the Donetsian Oblast, three districts (okruhas) existed on its territory from 1923 to 1930. The Donetsian Governorate was terminated in 1925. 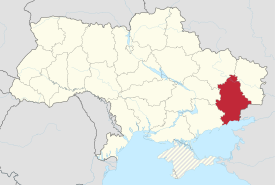 As part of Soviet Ukraine, the Donetsian Oblast was established on 2 July 1932 out of the Kharkiv Oblast, the Dnipropetrovsk Oblast and a number of raions that were under the direct administration of Kharkiv (then-capital of Soviet Ukraine). Artemivsk (today Bakhmut) served as the oblast's administrative center for two weeks until 16 July 1932, when the city of Stalino (today Donetsk) took on the role. Until 1938, the Donetsian Oblast included the territories of the modern Donetsk Oblast and the Luhansk Oblast. In June 1938 it was split into the Stalino Oblast (modern Donetsk Oblast) and the Voroshylovhrad Oblast (modern Luhansk Oblast). During the Nazi German occupation from fall 1941 to fall 1943, Donetsk Oblast was known as Yuzivka Oblast (after the original name of Donetsk). As part of de-Stalinization in the Soviet Union, in 1961 Stalino along with Stalino Oblast were renamed into Donetsk and Donetsk Oblast, respectively. During the dissolution of the Soviet Union, 83.9% of voters in Donetsk Oblast approved Ukraine's declaration of independence in the 1991 referendum. In the mid-1990s the region became known for its heightened criminal activity, including the killings of high-profile business people such as Akhat Bragin and Yevhen Shcherban. Donetsk Oblast was also a base for Ukraine's main pro-Russian political faction, Party of Regions, which became part of the Ukrainian government in 2002 and paved a way into Ukrainian politics for the powerful "Donetsk political clan". In 1994 a referendum took place in the Donetsk Oblast and the Luhansk Oblast, with around 90% supporting the Russian language gaining the status of an official language alongside Ukrainian, and for the Russian language to be an official language on a regional level; however, the referendum was annulled by the Kiev government. In late 2004, the Party of Regions was involved in the creation of a political project, South-East Ukrainian Autonomous Republic, which also supposed to include the Donetsk Oblast. Having close ties with the Russian government, the Party of Regions along with local communists and pro-Russian activists instigated the 2014 pro-Russian unrest which escalated into an armed conflict involving Russian assistance . In 2014 Ukraine lost control over its border with Russia in Donetsk Oblast. Currently, portions of the region are being controlled by the Novorossiya Armed Forces and claimed by the self-proclaimed Donetsk People's Republic. 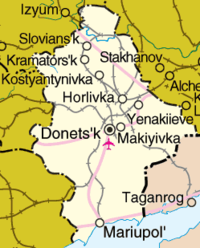 Donetsk Oblast is located in southeastern Ukraine. The area of the oblast (26,517 km²), comprises about 4.4% of the total area of the country. The oblast borders the Dnipropetrovsk and Zaporizhia Oblasts on the southwest, the Kharkiv Oblast on the north, the Luhansk Oblast on the northeast, the Rostov Oblast in Russia on the east, and with the Sea of Azov on the south. Its longitude from north to south is 270 km, from east to west – 190 km. The extreme points of the oblast's borders are: Bilosarayska Kosa (spit) on the south, Shevchenko of Velykonovosilkivskyi Raion on the west, Verkhnyi Kut of Shakhtarskyi Raion on the east, and Lozove of Lyman Raion on the north. The state historic-architectural preserve near the city of Sviatohirsk with the Sviatohirsk Lavra was nominated for the Seven Wonders of Ukraine. 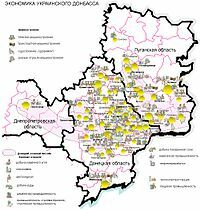 The province is primarily divided into 18 raions (districts) and 28 municipalities of equal status (22 miskradas and 6 mistos - cities of regional significance), including the provincial administrative centre Donetsk. These are listed below with their areas and populations. Territories controlled by the self-proclaimed Donetsk People's Republic. The province's secondary division consists of various municipalities that are governed by their councils. Those municipalities may consist of one or more populated places. All are administratively subordinate to the raion in which they are located. The local administration of the oblast' is controlled by the Donetsk Oblast Rada. The governor of the oblast' is the Head of Donetsk Oblast administration, appointed by the President of Ukraine. 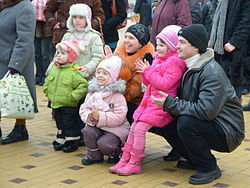 In 2013 the population of Donetsk Oblast was 4.43 million, which constituted 10% of the overall Ukrainian population, making it the most populous and most densely populated region of the country. Its large population is due to the presence of several big industrial cities and numerous villages agglomerated around them. During the 2004 presidential election, political supporters of Viktor Yanukovych threatened to demand autonomy for Donetsk and neighbouring oblasts if the election of their candidate was not recognised. However, no official moves were ever made. At the 2001 Ukrainian National Census, the ethnic groups within the Donetsk Oblast were: Ukrainians – 2,744,100 (56.9%), Russians – 1,844,400 (38.2%), Pontic Greeks – 77,500 (1.6%), Belarusians – 44,500 (0.9%), others (2.3%). At the 2001 census, the languages spoken within the oblast were: Russian — 74.9%, Ukrainian – 24.1%. The oblast also contains 21% of the country's Muslims. Map of the economic activity in the Donbas, including the Donetsk Oblast. The Donetsk Oblast covers more than one half coal, finished steel, coke, cast iron and steel production in Ukraine. Ferrous metallurgy, fuel industry and power industry are in demand in the structure of industry production. There are about 882 industry enterprises that are on independent balance, and 2,095 small industry enterprises in the oblast. The oblast' has a developed transport infrastructure which includes the Donetsk railway (covers 40% of national transportation), the Mariupol Port, the Donetsk International Airport, passenger airports in Mariupol and Kramatorsk, and dense road systems. In the Donetsk Oblast two special economic zones have been created, Donetsk and Azov, which have a privileged tax regime. In 1999, the gross grain yield in the oblast was about 999.1 thousand tons, sugar beets – 27.1 thousand tons, sunflower seeds – 309.4 thousand tons, and potatoes – 380.2 thousand tons. Also, 134.2 thousand tons of meat, 494.3 thousand tons of milk and 646.4 million eggs have been produced. 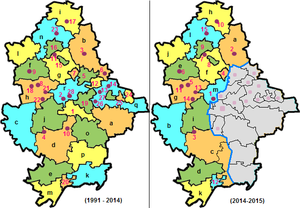 At the beginning of 1999 there was 2108 farms within the oblast. The Donetsk Oblast's climate is mostly continental, which is characterised by hot summers and relatively cold winters with changeable snow surfaces. East and southeast strong winds, high temperatures and heavy rain showers are typical in the summer. The average annual rainfall is 524 mm. The basic minerals found here are: coal (reserves – 25 billion tons), rock salt, lime carbonate, potassium, mercury, asbestos, and graphite. The area is also rich in fertile black earth. Important resources for recreation within the area are: the mild climate, the Sea of Azov coast, curative mud, sources of minerals, and radon and table water. Due to these numerous recreation resources, many resort hotels and camps are located here. There are about 26 health centres and pensions, 52 rest homes and boarding houses, and rest camps for children in the oblast. The curative[clarification needed] areas in the oblast include the Slovyansk salt lakes and mineral water sources. The oblast also contains many park zones, some of which are of great national value. They include the Khomutivsky steppe and the Azov sea coast. Overall, the Donetsk Oblast contains about 70 protected park and nature attractions including branches of the Ukrainian steppe park, six state reserves, ten memorials of nature, landscapes, and six park tracts. During the 1991 referendum, 83.90% of votes in Donetsk Oblast were in favor of the Declaration of Independence of Ukraine, fourth lowest in the country after Crimea, Sevastopol and Luhansk Oblast. A survey conducted in December 2014 by the Kyiv International Institute of Sociology found 18.5% of the oblast's population supported their region joining Russia, 53.8% did not support the idea, 22.5% were undecided, and 5.2% did not respond; insurgent-controlled areas (which hold over 50% of the population) were not polled. ^ "State Statistics Committee of Ukraine". Archived from the original on September 15, 2002. Retrieved September 1, 2013. ^ "Independence – over 90% vote yes in referendum; Kravchuk elected president of Ukraine],". The Ukrainian Weekly. 8 December 1991. ^ a b State Statistics Committee of Ukraine, Kiev. ^ "Self-proclaimed Luhansk People's Republic governs most residents". TASS. 25 September 2014. Retrieved 29 March 2018.